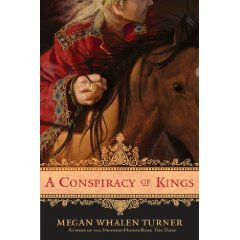 A Conspiracy of Kings by Megan Whalen Turner. Greenwillow Books, an imprint of Harper Collins. April 2010. Young Adult. Fourth in The Queen's Thief (aka Attolia) series. Reviewed from ARC from publisher. The Plot: Sophos is the unlikely heir to the King of Sounis. He knows he's not really fit to be heir; he actually hopes his uncle marries and has a child so that Sophos no longer has to worry about disappointing his family, his country, his friends. Unfortunately, other people have plans for Sophos. Wars have made the country and and its governance unstable, so rebels plot to kidnap Sophis and make him a puppet king. Things don't go quite as planned and Sophos finds himself somewhere he never thought he'd be. Can he ever be more than a pawn in a conspiracy of kings? The Good: You all know how much I adore this series; I've reviewed all three of the first books in this series, and yes, spoilers: The Thief, The Queen of Attolia, The King of Attolia. To those who have not yet read this series: please do. You will not be disappointed. The characters are rich and fully drawn; the plotting is exquisite; the themes are serious; there is humor, adventure, love, and serious questions about politics, war, loyalty. And, also? There will be spoilers in this review for the prior three books. So if you haven't read those three books and not being spoiled matters to you (and it doesn't to some readers), stop reading. And seriously, folks, I've been asking you for months to read the first three. So no excuses. Turner continues to both deliver what fans expect (Eugenides, plot twists, Gen, characters who are three steps ahead of everyone, Gen) and also to do what is unexpected, keeping the series and her writing fresh. Here, after giving us a glimpse of what we want (Gen! Gen! Gen!) we are instead given Sophos. It's his story; and half the time he tells it, directly, first person; and part of the time, it's third person. The switch affects the reading, from automatic sympathy with Sophos to being a bit more removed, a bit more objective. Remember how in The King of Attolia we were told that Sophos had disappeared after having been abducted by rebels? In A Conspiracy of Kings, we find out what happened to Sophos and why it takes him so long to reappear. A Conspiracy of Kings has more of the feel of a traditional young adult book than the previous two books. First, Sophos is younger than Gen (or at least acts like it! ); second, this book is as much about coming of age as it is about politics, war, and leadership. Gen may have hid things from the reader and had his own issues of loyalty and choice and free will, but at all times Gen was Gen. Sophos must become Sophos. Sophos is struggling with following his fate as the heir of Sounis; and, later, struggles with what it means to be a leader, a ruler, a king. He has to figure out what is right for him and what is right for his country and whether he can have both. Sophos has to work towards being a respected equal of the Eddis and Attolia. And isn't that classic young adult? Working towards adulthood by actions and choices, rather than age? The Queen's Thief series is, on one level, a helluva good read, pulling the reader along on a roller coaster journey with twists, turns, revelations, endearing characters. You get to the end, and want to go on the ride again -- and discover to your joy that it's even better than the first time, now that you know what is happening and why you can appreciate just how it is told (or, in some cases, not told). On another level, The Queen's Thief has much more depth than "just" an adventure story, "just" a fully realized fantasy world. It is a brilliant look at politics. Which, believe me, is very interesting -- the duplicity of court, the wars, the smiling face hiding anger or hatred, power, prestige, independence, risks, ambassadors, never knowing who to trust. Highly recommended for all ages. Of course it's a favorite book read in 2010 (see sidebar). Oh, I absolutely CANNOT WAIT to read this book! Loved your review, it has pumped me up even more! I skimmed your review after you said how well done the characters are-I will see if my library has this series. Sigh. It's finally almost out. I can't wait for everyone to be able to read it! Sigh. Still waiting impatiently for this one. Of course, I'm also still waiting to reread it right before it comes out. That would be now. i really, really, REALLY want that on a shirt!